For Mideast Christians, 2014 has been a year of bloody disaster. Are these churches on the edge of extinction? This past summer, that hope collapsed. In a ghastly reminder of Nazi savagery against Jews, Christian homes were marked with the Arabic letter ن for Nazarenes—Christ followers—or R for Rwafidh, a term for Protestants, and inhabitants were targets for abuse or murder. Islamist militants have controlled Mosul since June 10. Even if the total extermination of each and every believer is not the goal, those ancient communities and churches face the prospect of utter ruin. 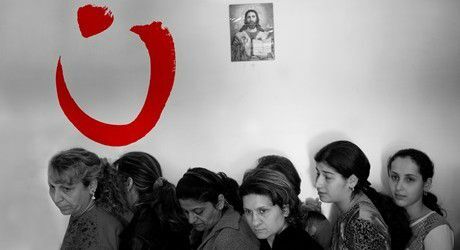 To that extent, the end of Christianity in Iraq is within sight. The current battles are part of a lengthy story. Islam gained power over the Middle East in the seventh century, but it was several centuries before Muslims became an overwhelming majority. Christians operated under Muslims’ political rule, but the Coptic Patriarchate of Alexandria, Egypt, and the Baghdad-based Church of the East remained mighty forces of global Christianity. They retained that position for more than 500 years. Not until the 14th century did persecution become systematic and violent. Read more here: Is This the End for Mideast Christianity?